Chrysoberyls are a group of stones discovered in 1790 by Saxon geologist Abraham Gottlob Werner. This group includes three stones with the same physical and chemical characteristics but extremely different from appearance, mainly because of their different colouring elements. The common chrysoberyl which possesses a yellow colour to yellow green and yellow brown is coloured by iron. The very rare alexandrite coloured partially by some chromium with its particular change of colour and the cat’s eye, on which the eye comes from parallel channels or from rutile inclusions going to the same direction. The eye appears when the stone is cut in cabochon. Chrysoberyl cat's eye was formerly called cymophane. This cat’s eye with its very much in demand "milk and honey" colour, can also show a change of colour, going from green to red. It is the rare alexandrite cat’s eye. The name chrysoberyl comes from two Greek words meaning beryl and gilded. This very hard stone has nothing to do with classic beryl gemstones which are much softer. Beryl is a silicate of aluminium and beryllium and chrysoberyl, an oxide of aluminium and beryllium. 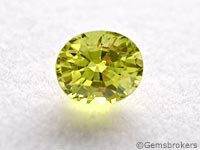 For years, we gave it the name chrysolite, name which included all the yellow to green stones. In the 18th and 19th century, this gemstone coming from Brazilian sources has been trendy in Europe through the Spanish and Portuguese jewellery back then. Mainly because of its yellow colour, the chrysoberyl is often related to money. It is the stone of discipline and self-control. It is supposed to facilitate concentration and learning abilities. It also would boost intuition and creativity, principally in business affairs. Chrysoberyl would also have the faculty to transform negative thoughts into positive energy. It would also help the body to regulate adrenalin and cholesterol and would be beneficial for lungs and liver. Two exceptional stones of 113 and 120 carats are on display at the Smithsonian Institute of Washington D.C. in the United States.